Resources, activities, and lessons from a high school English/Language Arts Teacher. This week is Banned Books Week, sponsored by The American Library Association. I wrote a post on my other blog about it, but thought I would add this link to The Huffington Post's InfoGraph with the Top 10 Challenged Books of 2010, and the reasons why. It is amazing to see many of my students' favorites on the list. But some of the reasons for why they were challenged are baffling. I think it just goes to prove that many of the people who challenge these books read only small parts rather than basing their objection on the book as a whole. 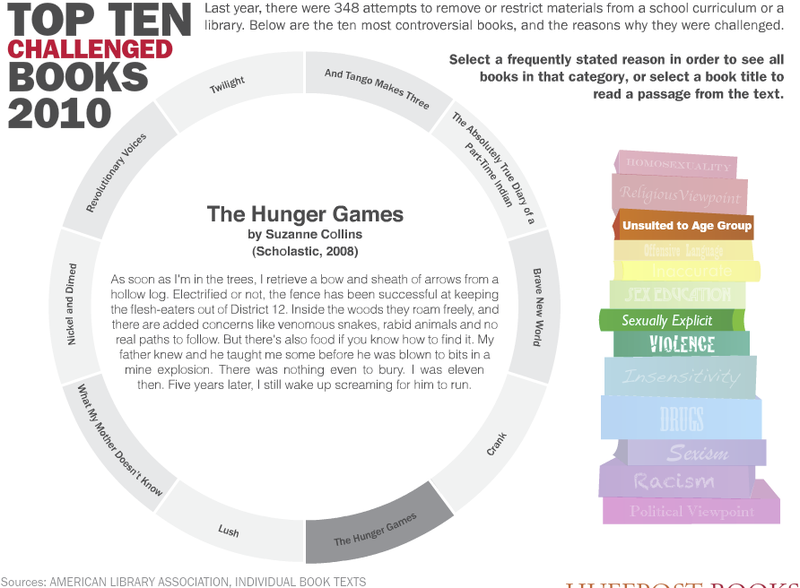 The interactive InfoGraph can be found here on "Huff Post Books" page. 1. Do you believe in freedom of speech? Explain. 2. Do you believe in censorship, or removing materials from the library or classroom if someone opposes them? Why/why not? 3. Are there any books that should not be allowed in schools? Explain. 4. Are there any books that should not be allowed in libraries? Explain. 5. Are there any books that should never be printed? Explain. -If you answered "no" to number 1, but "yes" to numbers 4 or 5, then you need to change your answer to number 1 to "yes." "If we don't believe in freedom of expression for people we despise, we don't believe in it at all." This always makes them stop and think. If they wish to have freedom of speech for themselves and their beliefs, it is only fair to allow it for all. It ceases to be freedom of speech when we limit others' rights. 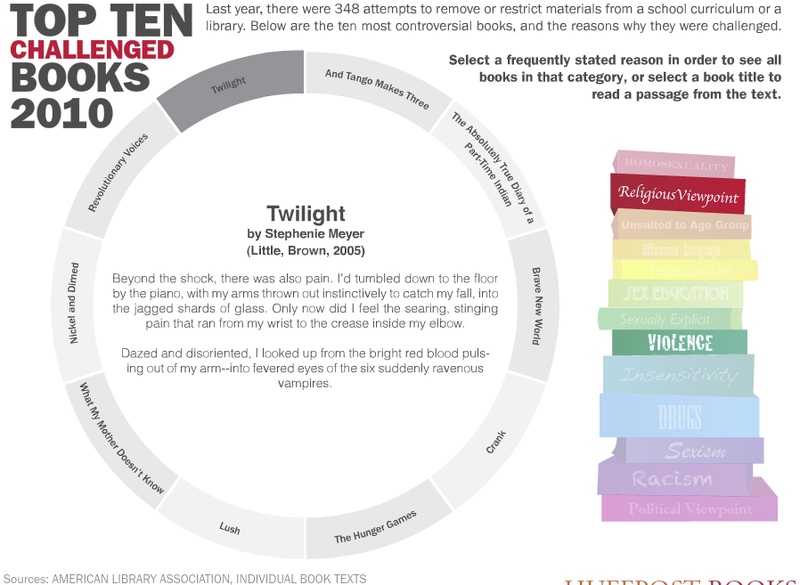 Do you have a discussion with your students about censorship and/or banned books? 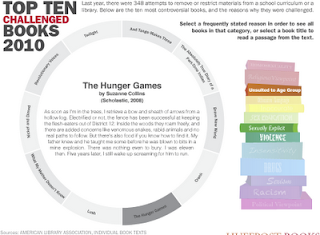 FREE Bookmarks - "I Read Banned Books"
FREE Bookmarks - "President Snow's Panem"
Editable teaching materials you can share digitally with your students. Visit Tracee Orman's profile on Pinterest. Offering Choices for your Readers: Comic-Book Craze! Elementary vs. High School Teachers: Who has the tougher job? Click to see all of Kimberly Geswein's fabulous fonts! Copyright © 2013, Tracee Orman. The expressed opinions are my own; not affiliated w/my employer. Simple theme. Powered by Blogger.